1- All airstrikes and artillery bombing of the old neighborhoods of Mosul MUST be stopped, and refrain from using heavy artillery to respond to ISIL’s fire. ISIL’s fire can be treated without the use of heavy artillery. 2- Al-Hadbaa minarat has endured severe​ damages due to the use of heavy artillery fire, and it may collapse at any moment. 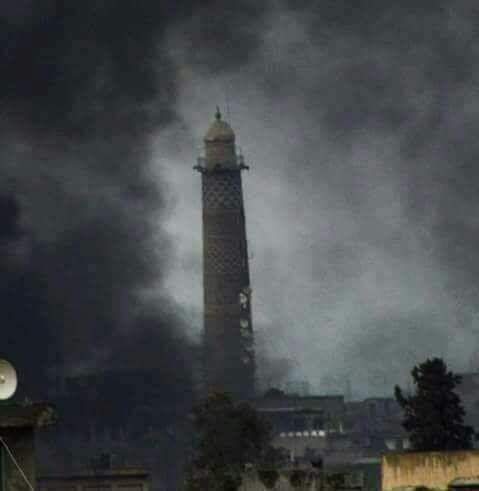 This minarat is the last standing sign of Mosul’s existence. We urge the international community, the Iraqi military and government to refrain from fighting in the vicinity of the minarat, or clost to it. 3- Refrain from targeting the civilians in this battle. The number of the civilian casualties in the battle for the western bank is rising to hundreds, in addition tothe thousands of IDPs and war escapees. The main goal of this battle is to protect the civilians, therefore, we ask all factions to respect the lives of the civilians and refrain from targeting them. 4- The Iraqi forces and the coalition must save the civilians, not targeting them. It is a must to change the battle’s plans and push ISIL to fight out of the old city. Previous So, What is ISIS? Our thoughts are with you . What action would you like people in the Great Britain to do to support you. I have shared this but feel that this is simply inadequate and would like to do more.